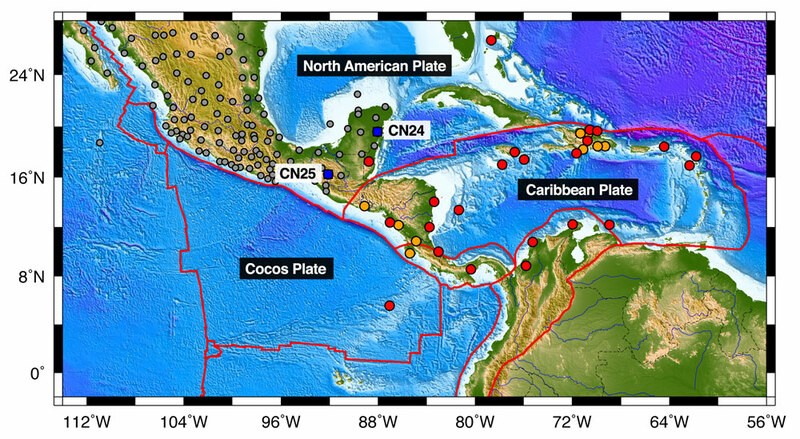 Two sites at the most southern part of the North American continental plate were installed in Mexico as part of the ongoing Continuously Operating Caribbean GPS Observational Network (COCONet). COCONet is funded by the National Science Foundation with the aim of developing a large-scale geodetic and atmospheric infrastructure in the Caribbean that will form the backbone for a broad range of geoscience and atmospheric investigations with direct relevance to geohazards. Though Mexico is located on the North American plate, its role in understanding large-scale Caribbean geologic and atmospheric processes is important. Mexico is rich with geologic and atmospheric research opportunities that also render the region vulnerable to potentially devastating natural hazards. Few countries have as much land area exposed to earthquake and volcanic hazards as Mexico. Surrounded by four tectonic plates, the region has sustained damaging earthquakes and will experience them again in the future. These earthquakes, along with volcanic eruptions, hurricanes, heavy precipitation, flooding, and landslides are high priorities for forecasting and research. 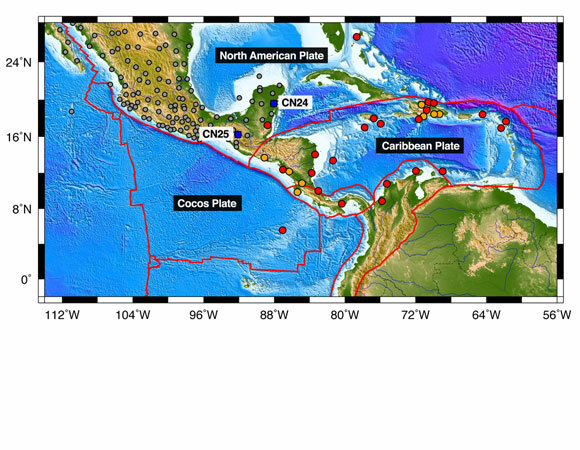 The North American continental plate's southerly boundary with the Cocos Plate to the west and the Caribbean Plate to the east is a transform fault, represented by the Cayman Trench under the Caribbean Sea and the Motagua Fault through Guatemala. The rest of the southerly margin which extends east to the Mid Atlantic Ridge and marks the boundary between the North American Plate and the South American Plate remains poorly understood. The two recently installed CN24 and CN25 GPS sites will be able to provide some constraints on overall plate motion activity at the important boundary between the North American and Caribbean plates. These two sites are also crucial for tracking tropical storms and hurricanes that leave the Caribbean Sea and enter Yucatan and the Chiapas mountains or continue their track into the Gulf of Mexico. This vulnerable region has been hit by three category 5 hurricanes since 2005. Figure 2. 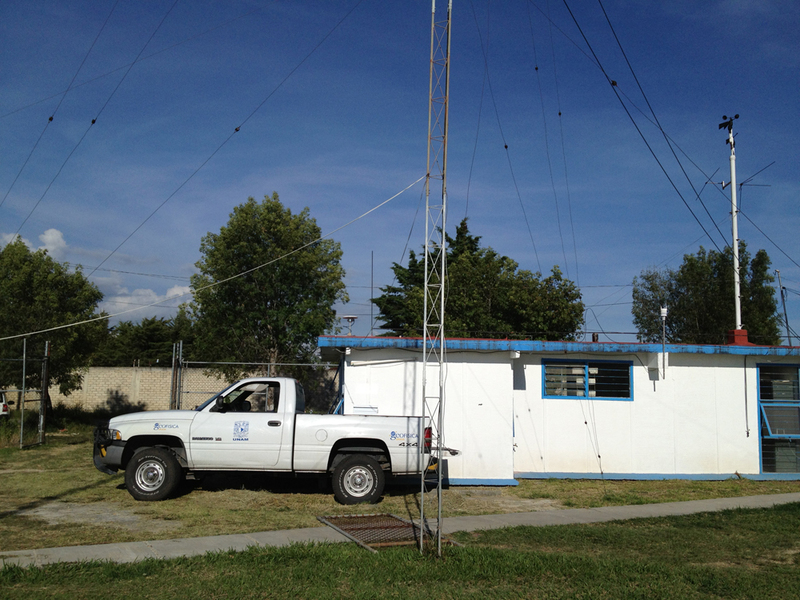 COCONet station CN24 in Felipe Carrillo Puerto, Quinto Roo, Mexico. Photo by John Sandru. Figure 3. COCONet station CN25 in Comitan De Dominguez, Chiapas, Mexico. Photo by John Sandru. 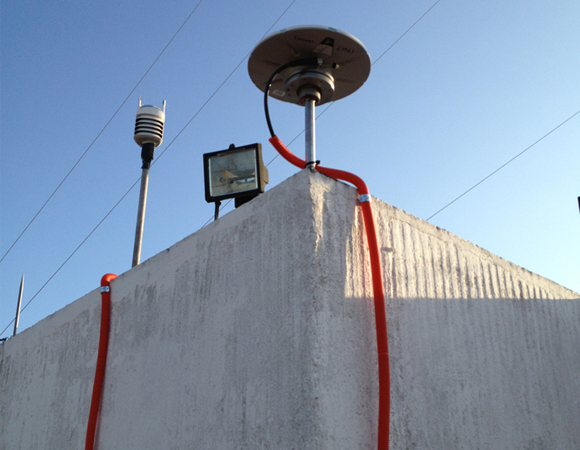 CN24 and CN25 sites will eventually link COCONet and TlalocNet, a span of GPS stations that will be installed across Mexico. TLALOC stands for Trans- boundary, Land and Atmosphere Long-term Observational and Collaborative network. Tlaloc was the Aztec god of water, feared for his ability to deliver hail, rain, lightning and master of the underworld; his name is thought to derive from the Nahuatl word for earth. The name provides a linkage between the solid earth and water cycle roles envisioned for both CocoNet and TlalocNet. 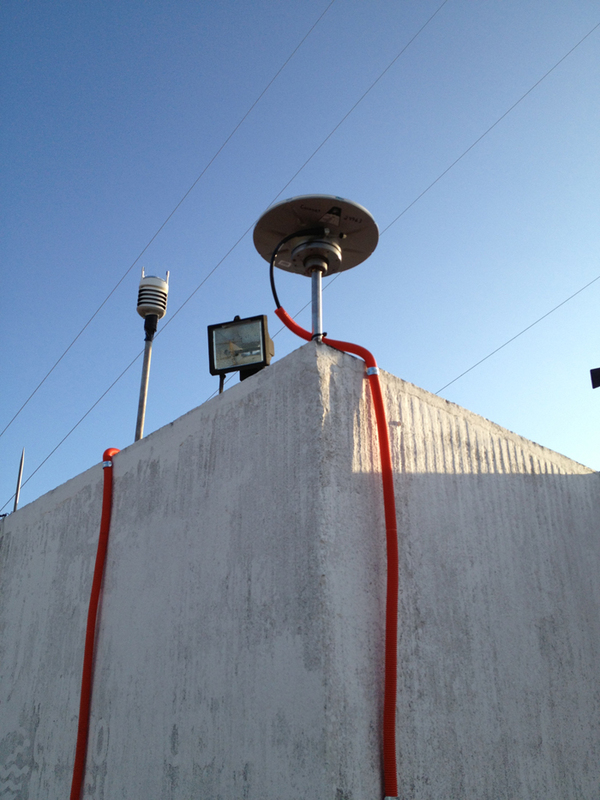 UNAVCO field engineer John Sandru and Luis Salazar-Tlaczani from UNAM-Geofisica installed site CN24, located in Felipe Carrillo Puerto, Quintana Roo and site CN25 in Comitan De Dominguez, Chiapas. If the TLALOC network is funded, UNAVCO also plans to build 9 new continuous GPS and Met stations and to upgrade 29 existing GPS sites from previous investigators for the TLALOC network. 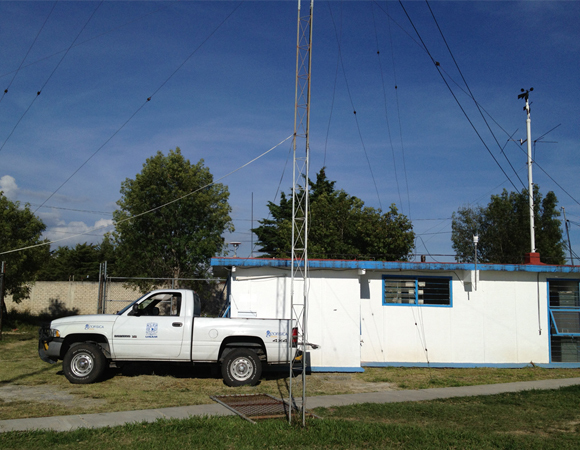 Servicio Nacional de Mexico plans to contribute 17 GPS-Met sites, and the TLALOC project will independently build approximately 80 new sites for a total of roughly 150 GPS-Met stations stretching across Mexico.